BOCA RATON, Fla. — While restaurants and cities nix plastic straws, a Florida Atlantic University apparel store in Boca Raton is doing away with another type of plastic commonly found littered around beaches -- balloons. “We made the decision almost instantly to never carry them again," said Mark Noll, owner of It's Owl Time on NW 20th Street. Noll, an FAU alumnus, opened his store six years ago and has been selling FAU-themed balloons for most of that time. "Graduation times, everybody wants balloons or when they're celebrating getting accepted to FAU, so balloons were a big item in here," he said. Those FAU-themed rubber balloons were so popular the store recently sold out of them. 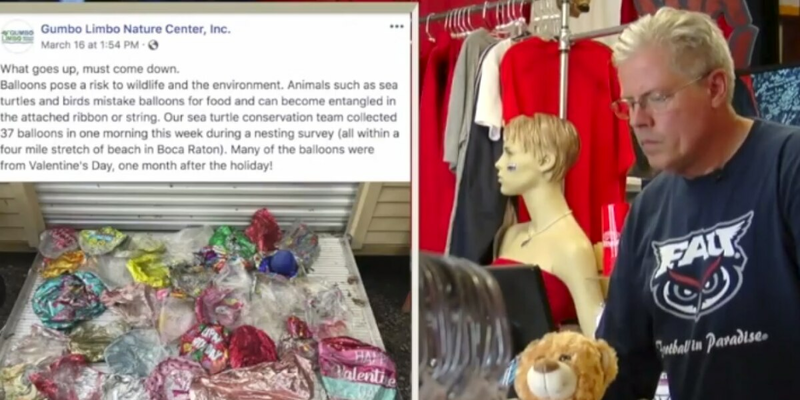 Noll was planning to reorder the balloons until he came across a Facebook post from Gumbo Limbo Nature Center, showing some of the 37 balloons staff members found in one morning last week on the beach in Boca. Gumbo Limbo staff members pick up litter from the beach while monitoring for sea turtle nests daily. Balloons are frequently part of their trash haul, but they find more of them after holidays. Valentine's Day balloons were some of the ones they picked up last week. “Unfortunately, our conservation team finds them every single week," said Caitlin Bovery, assistant sea turtle rehabilitation coordinator at Gumbo Limbo. Bovery said balloons and their ribbons can mimic food, such as jellyfish, causing animals to ingest them. The Gumbo Limbo team knows firsthand the risk these kinds of balloons can pose to marine life. “We’ve absolutely seen sea turtle cases in our rehabilitation facility where they’ve ingested plastic," Bovery said. Bovery suggests people use bubbles as an eco-friendly alternative to balloons. If you do choose to use balloons, do not release them into the air and dispose of them properly. It is against the law in Florida to intentionally release more than ten balloons. Noll now hopes other businesses follow his lead and offer other kinds of party supplies that won't pose as much risk to the environment. “We hope that we can inspire somebody else to do it as well," he said.